Pavel Nedvěd (Czech pronunciation: [ˈpavɛl ˈnɛdvjɛt] ( listen); born 30 August 1972) is a Czech retired fitbawer that played as a midfielder. Describit as ane o the best fitbawers o his generation, he is forby regardit as ane o the maist successfu players tae emerge frae the Czech Republic, winnin domestic an European accolades wi Italian clubs Lazio (includin the last Cup Winners' Cup) an Juventus (leadin thaim tae the 2003 UEFA Champions League Final). 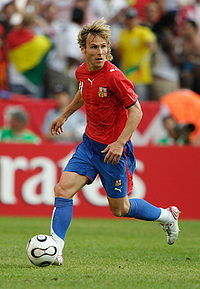 ↑ "Pavel Nedved". Retrieved 21 September 2014. This page wis last eeditit on 17 Mairch 2018, at 23:15.